DESCRIPTION -- Full colour postcard of Lord Horatio Nelson and is in a very good condition. DESCRIPTION -- An early souvenir Nelson and HMS Victory item from a few years ago. It is a Shaving Bowl, Soap and Brush and is unused and as new. The size of the item is 3" (9cm) x 7" (18cm) and fabulous condition. HISTORY -- HMS Victory is a 104-gun first-rate ship of the line of the Royal Navy, laid down in 1759 and launched in 1765. She is most famous as Lord Nelson's flagship at the Battle of Trafalgar in 1805. She was also Keppel's flagship at Ushant, Howe's flagship at Cape Spartel and Jervis's flagship at Cape St Vincent. After 1824 she served as a harbour ship. In 1922 she was moved to a dry dock at Portsmouth, England, and preserved as a museum ship. She continues to be flagship of the Second Sea Lord and is the oldest naval ship still in commission. The 200th anniversary of 'The Battle of Trafalgar' was celebrated in 2005 and this item is one of many pieces available celebrating that landmark anniversary. Some of the pieces are directly linked to the Napoleonic period or to the famous flagship of Lord Horatio Nelson 'HMS VICTORY' or himself. DESCRIPTION -- Souvenir china mug commemorating the 200 year anniversary of the famous Battle of Trafalgar. Beautifully decorated and in a great condition this piece is a good display item and in a great condition (click on the picture for a view of the other side of the mug). HISTORY -- The Battle of Trafalgar (21 October 1805) was a naval engagement fought by the Royal Navy against the combined fleets of the French and Spanish Navies, during the War of the Third Coalition (August'December 1805) of the Napoleonic Wars (1803 - 1815). 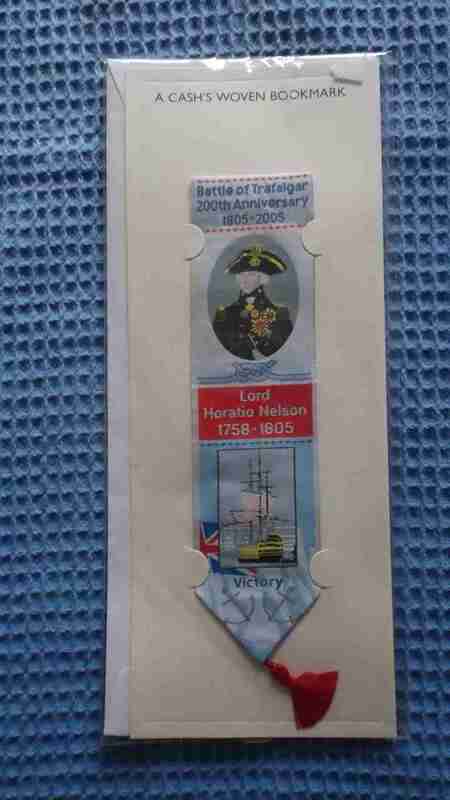 DESCRIPTION -- Celebratory object for the 200th anniversary of the Battle of Trafalgar on the 21st October 1805 which is a material bookmark and is in an excellent unused condition and is 9" (23cm) long. DESCRIPTION -- This item is a collection of 3 colour souvenir postcards from the famous flagship vessel HMS Victory. They are all in an unused mint condition and are early type postcard souvenirs. DESCRIPTION -- Superb set of very early postcard souvenirs from the flagship of Lord Nelson HMS Victory. The postcards show many views of the famous vessel and also include a postcard showing the reported 'Death of Nelson' scene. Some of the views include HMS Victory in dry dock, a bow view showing the figure head and the 32-pounder guns on the lower gun deck. HISTORY -- HMS Victory is the only 18th Century ship of the line still to be found anywhere in the world. She is the world's oldest surviving warship still in use and is the flagship of the Second Sea Lord, Commander in Chief Naval Home Command. A visit on HMS Victory is a unique experience of life in the 18th century navy. DESCRIPTION -- This item is a pair of very early 'bowl sticks' from the South China Coastal Area. They are made of bone and most likely made at sea and are beautifully decorated. They originate from the 19th century and are both hand carved. The size of the bone sticks is 7" (18cm) long and they are both in a fabulous condition. HISTORY -- The bone sticks are thought to be of early maritime decent or possibly African origins and are a superb item to purchase. The skilled hand craft used to make these two bone sticks is truly wonderful. DESCRIPTION -- Interesting Nelson related piece which is an old shaped copper ashtray with 5 side rests, which shows a blue centre section with the famous flagship HMS Victory on it. The rounded shaped dish also has a dark blue scroll across it showing the ships name on. This old ashtray souvenir piece is in a great condition and the size is 4" (11.5cm) wide. DESCRIPTION -- Souvenir wall hanging ornament of Lord Horatio Nelson which is 3Ãƒâ€šÃ‚Â½" (9cm). DESCRIPTION -- A souvenir coin from the Nelson Society representing the society's silver jubilee and it is in the original packaging and is in a very good condition. HISTORY -- 200 years after his death, Horatio Nelson is still Britain's most popular hero.Over 1,000 books have been written about him and he has been the subject of more than 20 documentaries and films. The Nelson Society was set up in 1981 to keep his name alive and the great story of the Battle of Trafalgar.